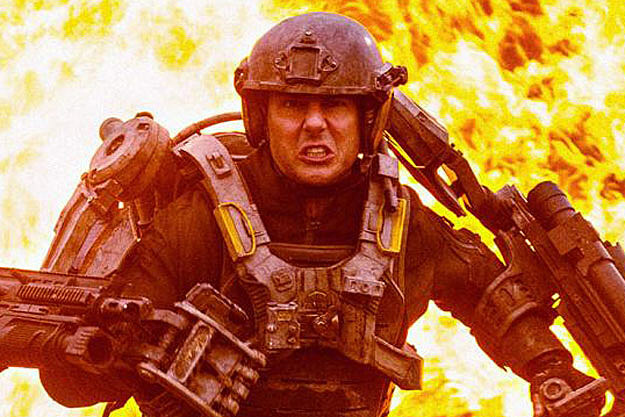 Tom Cruise’s sci-fi thriller All You Need is Kill, due next summer, has received a much-needed name change. The movie, now known as Edge of Tomorrow, finds Earth at war with an alien race called the Mimics. Cruise stars as unlucky soldier Bill Cage, who after being killed in battle with the invaders is caught in a time loop and must relive the same battle over and over. Becoming a smarter soldier with each battle, Cage takes the fight to the aliens with the help of veteran soldier Rita Vrataski (Emily Blunt). Edge of Tomorrow is based on a graphic novel by Hiroshi Sakurazaka. The movie so far looks like a mash-up of Source Code and Halo, or a Groundhog Day with more exploding heads, neither of which are necessarily a bad thing. Edge of Tomorrow will hit theaters in IMAX 3D on June 6 next year. This entry was posted in News and tagged 2014, alien, All You Need Is Kill, Edge of Tomorrow, Emily Blunt, Halo, Hiroshi Sakurazaka, sci-fi, thriller, tom cruise. Bookmark the permalink.